I did an unwitting experiment yesterday. My only intention was a day of rest. It had been a long while since I’d had a day to myself. Normally these are luxuriant days, doing only what I desire to do, but they come few and very far between. My husband had taken up the challenge of doing the MS Ride once again. 75 miles to Key Largo. And back. On a bike. Last year he’d said he wasn’t doing it again and I agreed. He’s not exactly 16 anymore; he rides frequently, just not 150 miles in two days’ time. But his company came up with the dough for donation and yesterday he took off at dawn. I figured since he’d be away all weekend, I’d chill. My daughter and granddaughter, who are staying with us at present, left for the whole day too. I’d kept Alyssa on Friday and we’d worked most of the day on a quilt that she’d designed. I’d shown her my collection of quilt sketches drawn and colored on graph paper and that made her want to draw her own so that I could make her a blanket she said. I took her scribbles and translated them into alternating squares and rectangles, which she then filled in with color pencils. 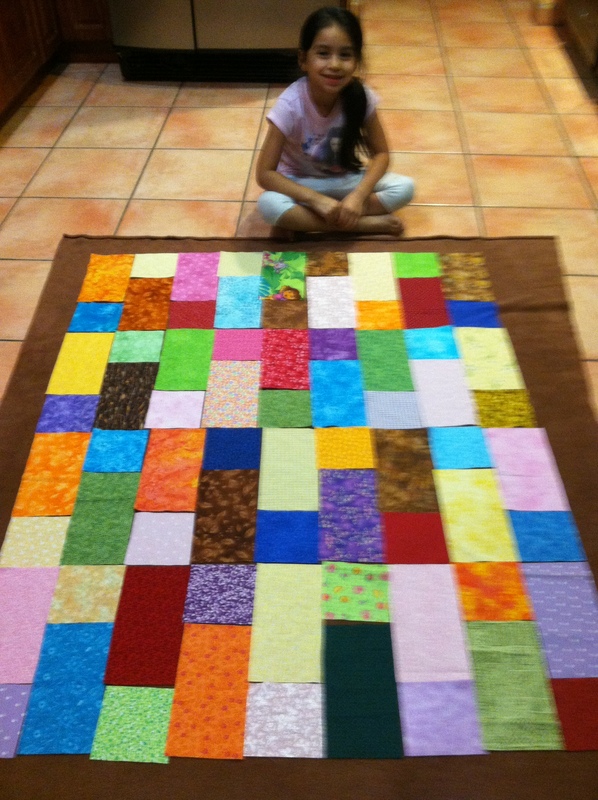 It took several days for her to select a fabric from my stash to match each square and rectangle. I then cut them out while she watched. Friday, we took advantage of her staying home from preschool to finish all the cutting and to lay out the pieces on a piece of fleece that I use as a “design wall.” (The cotton fabric sticks to the fleece and provides me with a road map to follow as I sew the pieces together.) It was a busy day that culminated with both us falling asleep early that night. Yesterday, I slept late and then watched TV all day. Or rather, I glanced at the TV all day while I read. I did make the bed but didn’t get out of it, getting up only to grab breakfast, lunch and dinner. Simple, light meals that required no time at all. I didn’t feel one smack of guilt for hibernating. Not even a smidgen. In fact, I didn’t feel much of anything until late in the evening when I was preparing to pour some green tea and the ice cubes fell through my fingers. I had a bunch in my hand transferring them from the ice container in the freezer to my glass and then, they were all over the floor. My husband hates that I do that instead of using the ice dispenser on the door, but it’s so noisy I prefer to just open the freezer and grab a handful. Normally it goes smoothly, but this time I was left staring at shards of ice splayed around me on the floor. Why had I dropped them? Why had the ice cubes slithered through my fingers so easily? The day before I’d been wielding a lethal rotary cutter slicing through 64 different fabrics with exacting precision. I flexed my hands and noted that my fingers were stiff and swollen. They felt as if I’d just woken up. But it was the evening, when my fingers are supposed to be most nimble. But my hands didn’t know it was evening. My hands didn’t know they were supposed to be loosened up by then. They only knew that they’d done next to nothing all day. That they’d been mostly at rest as if the night had extended on through the day. The most intricate thing they’d done was to hold a phone, a tablet or a TV controller. There’d been no fine motor functions expected of them. No cooking, no housework, no driving, no typing, no writing, no sewing. In essence, there’d been no wake-up call for them at all. Why did it take me till evening to notice? I have no idea. Maybe I was enjoying the idleness too much. But one thing was definitely reinforced by my inaction. Idle hands become frozen hands. Placing down the pieces, one by one. 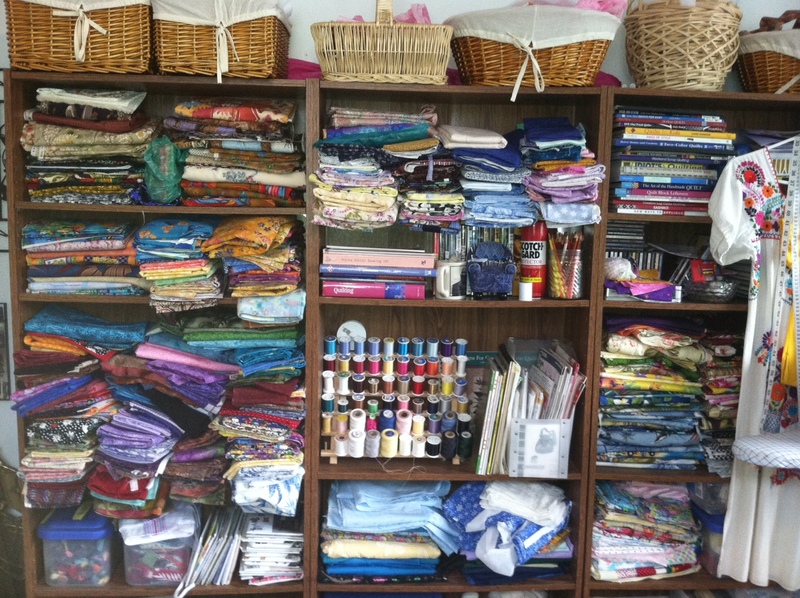 My fabric stash, or rather, part of it. This entry was posted in Uncategorized and tagged MS Ride, multiple sclerosis., Quilting, RA on March 8, 2015 by Irma. Hi Irma: What a lucky girl to have you has a grandmother! I try to take one or two “rest” days a month. They really seem to help me catch up and feel better. Obviously you need more of them so you can train your body (and RA) how to behave! 🙂 So glad you got a peaceful day to yourself, but sorry your hands didn’t cooperate. Hi, Carla. It’s so much fun working with her. It’s slow going because I want her involved in each step and we can only work on the weekend. 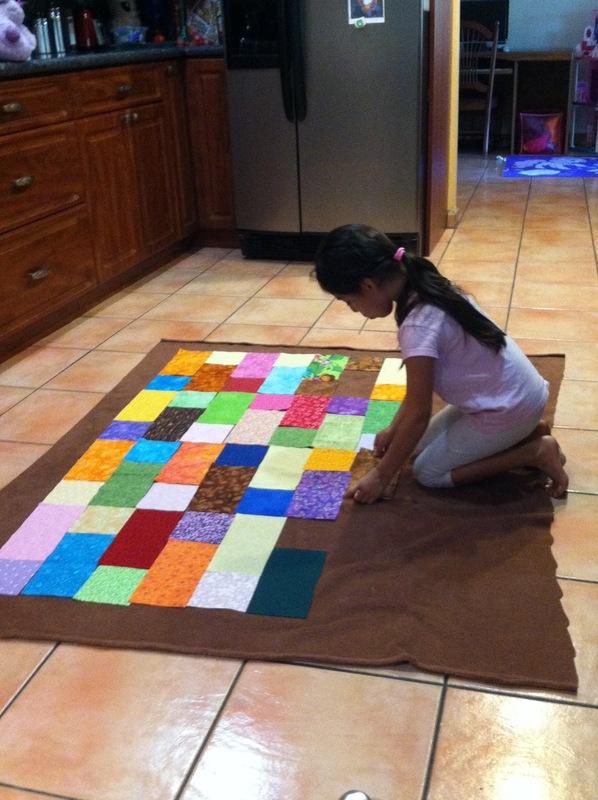 Who knows maybe she’ll be a quilter one day. I was surprised that my hands were sluggish that day, but then so was I! It’s always nice to have those peaceful days – sorry to hear it was shattered by stiff unyielding hands. Perhaps next time, be just as relaxed, but try to do some finger exercises to keep the stiffness at bay. Other than your hands, and the ice shards at your feet, it sounded like a lovely day. Stay well, Hugs. Hi, J. It is nice to have days where no one and nothing beckons. I work best under pressure and apparently so do my hands. But it was a nice day, after all. Hope you are doing well. What a pretty quilt the two of you are making! Alyssa is lucky to have such a fun, creative, and talented grandma! It’s so nice to be able to take a day off and just relax, but it seems that with RD, even days like that have consequences. Aggravating! Still, I’m glad you were able to do it. Even with stiff, swollen hands, we need those down days. Hi, Wren. I’ve already suggested alterations and presented them for her approval. The object is to make the quilt bigger and she “signed off” on the changes. I miss my kids when they were little, so these moments with my granddaughter are that much more special. Hope you’re feeling lots better!